We arrived in Livingstone just before dusk. The streets basked in the orange glow of the setting sun. We began inspecting the myriad of tourist campsites in the town; this was by far the most tourist-filled place we had seen in Africa so far. All manner of tastes and budgets were accounted for, at Zambia’s biggest tourist attraction. The first was for backpackers. Murels, bean bags, beer bottles and hammocks. We didn’t like it. We looked at a few more, and after realising that we had no choice but to mingle with the tour bus crowd on this particular night, we eventually settled on a site on the banks of the Zambeze River, packed with tents and safari vehicles. At $10, it was the most expensive campsite we had stayed at. 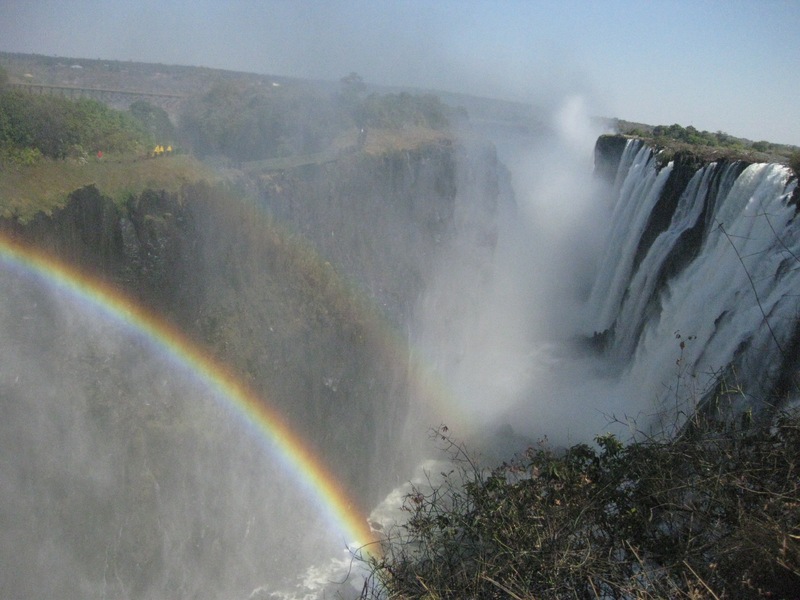 But who cares, really, about the campsite, when Victoria Falls was just down the road. We went to the bar and ordered three cold Mosi Lagers, a Zambian beer honouring after the Victoria falls (Mosi-oa-Tunya, ‘The smoke that thunders‘). Afterwards, we drove into the main street of Livingstone to find a restaurant. We found Da Fusion, a funky local restaurant with a cool African vibe. The lights were dim, there was live music and the bar had a tropical-themed grass roof over it. We sat down and ordered our first African meal; so far we had eaten almost exclusively hot chips or camp food. Nshima is a bland maize paste, eaten with the fingers and served with a side dish such as vegetables, meat, or beans. We ordered three serves of Nshima, with beans and spinach. We ate with our hands, like the locals did, and washed them in the hand washing bowl provided. On the street on the way back to the car after dinner we bumped into a young Botswanan man who had recognised us from the border crossing. He was friendly, laughed a lot and was full of energy. He was going out clubbing in Livingstone, saying that he makes the trip over the border on Friday and Saturday nights just to party. 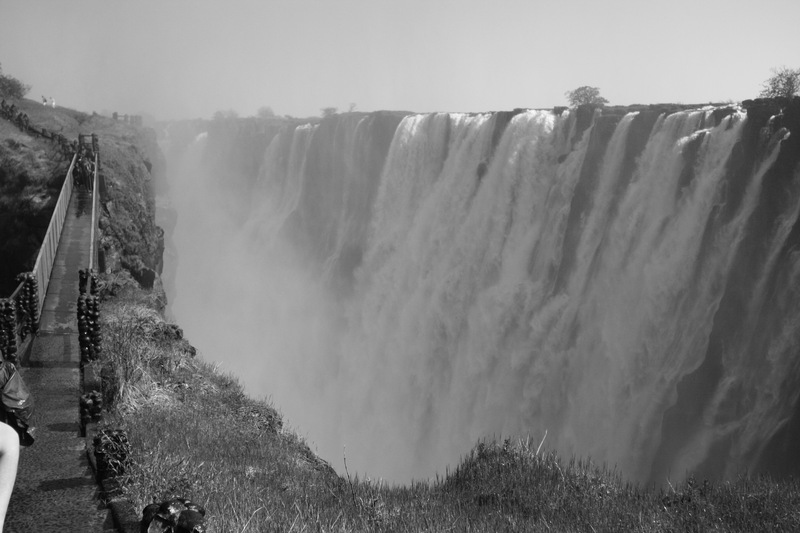 In the morning, we followed the sound of thunder to Victoria Falls, just outside Livingstone. 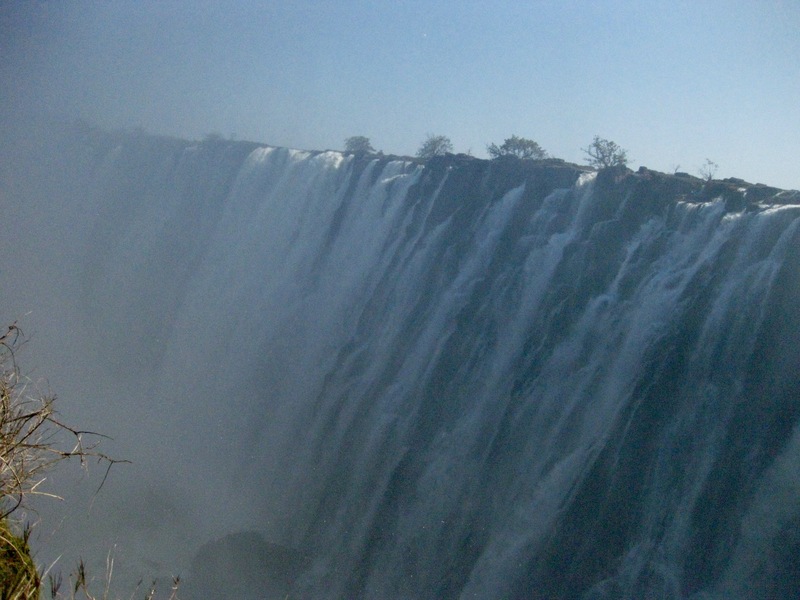 The largest waterfall in the world, a curtain of rushing white water two kilometers long, furiously slicing Zambia and Zimbabwe in two. We paid a small entry fee to the Victoria Falls park and started walking along one of the paths that offer different views of the spectacle. Arcing around the side, the high road was overrun with baboons grooming each other and masturbating by the side of the path. Despite the fact that they seemed impartial to human presence, we gave them a wide berth; they just ignored us. When we reached the end we were greeted with a spectacular long-range view of the waterfall. The wide river poured into a deep canyon in the earth’s surface. The force of the falls was mind-boggling. Mist rose, then fell heavily like rain, whilst permanent rainbows beamed from the lip of the waterfall. We could see the bridge on the Zimbabwean side, as the screams of brave bungee jumpers disappeared into the distant river below. None of us had he stomach for it. We tried another path; the hair-raising one that crossed directly in front. At the entrance they were renting raincoats; we scoffed at the idea and preferred to get soaked. 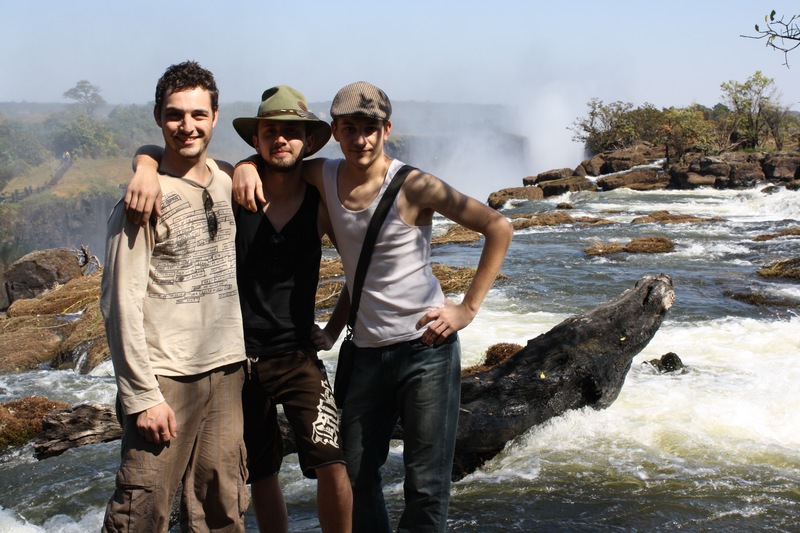 After all, this would be our only chance to be able to feel Victoria Falls’ wrath. 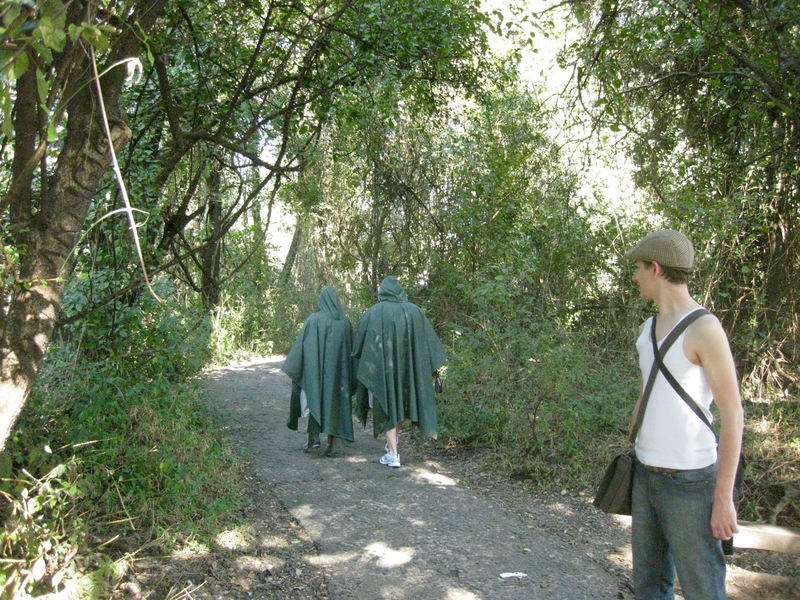 The raincoats were green plastic with hoods, and we laughed at other tourists shuffling past looking like hobbits. A narrow bridge linked two cliff faces and we walked across, single file, facing off with the extraordinary waterfall. It was so wide, we couldn’t see the end in either direction. The spray it gave off was like monsoon rain and soaked us down instantly. A double rainbow formed magnificently in front of our eyes. We smiled and basked in the water, and took photos standing irresponsibly close to the edge of the cliff. Another path was leading down into the canyon, a long walk with lots of stairs that took us into jungle beneath the waterfall. It was a great perspective to see what it looked like from below. Walking back up the steep stairs was challenging; it was not an easy climb, despite having competed in a stair climb of Sydney’s highest building a few weeks ago. Jeff and Wessel, both smokers, took considerably longer to climb to the top and I rubbed it in when they arrived, sweating and out of breath. The final path led us to the top of the waterfall, a view from the river above. The river flowed slowly and was significantly less dramatic but the roar of thunder remained. A fisherman stood on the rocks on the very edge of the waterfall, rod in hand, catching dinner. The baboons were rampant up there, one had pulled over garbage bin and was happily rifling through. 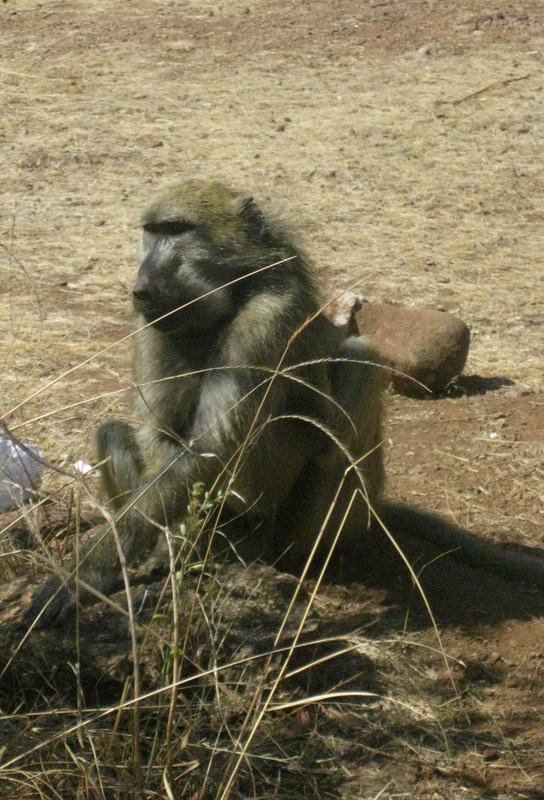 Back in the carpark, baboons were sitting on cars, jumping from vehicle to vehicle with loud thuds. A man in traditional tribal costume was haggling visitors in the carpark for commemorative photos with him. There were stalls, selling statues, t-shirts and other items. We drove on, elated by our experience.